OEM certificate (xrm-ms) which corresponds with OEMID and OEMTableID (Windows Marker) in SLIC table. 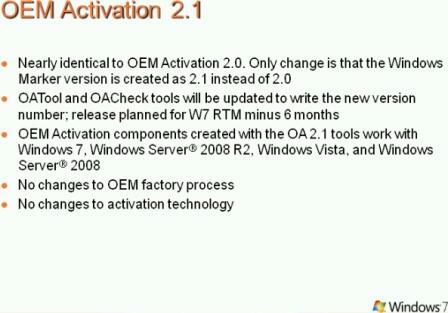 SLP OEM Activation 2.1 works in very much the similar way of OEM Activation (OA) 2.0, with no change to activation technology, and OEM does not require to change factory process to accommodate new SLP 2.1 OEM activation. The only changes is Windows Marker version is now version 2.1 instead of 2.0. Even the digital certificate, which has file extension of .xrm-ms, signed by Microsoft with OEM’s SLIC public key (0x9C bytes) with Microsoft’s private key together with OEMID of SLIC table, is unchanged. The second part of SLIC table, Windows Marker (0xB6 bytes) is created and signed by OEM with OEMTableID and OEMID together with OEM private key that matches OEM’s SLIC public key. OATools released by Microsoft will now write a new version 2.1 of OEMTables, hence a new Windows Market in different binary format for Windows 7 and Windows Server 2008 R2 OEM activation. Windows Vista and Windows Server 2008 accept both Windows Marker formats (OA version 2.0 and OA version 2.1), but not vice versa. Thus, aside from new OEM-SLP product key (leaked Windows 7 Ultimate OEM-SLP product key) which is required for each edition of Windows 7 and Windows Server 2008 R2 in order to complete the OEM activation process, whether or not the SLIC 2.1 exists in the BIOS will determine whether the installed Windows 7 or Windows Server 2008 R2 can achieve instant offline activation on system boot up. Download and install RW-Everything Read & Write Utility. Run RW-Everything, then click on Access pull down menu, follow by ACPI Tables. In the opened ACPI Table window, click on SLIC tab. The display will look something like the illustration below, or see SLIC 2.0 and 2.1 example here. 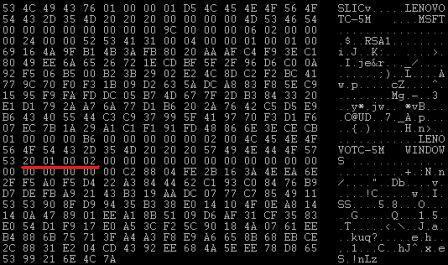 If the 4 bytes in highlighted area are 01 00 02 00, the SLIC is version 2.1. If you’re having SLIC 2.0 in BIOS, try to wait for computer manufacturer if it will release new BIOS update that includes SLIC 2.1 table. Else, it’s possible to modify the BIOS (hardmod or biosmod) to include the SLIC 2.1 (assistance available at Windows 7 forum), or uses a OEM-BIOS emulator which commonly known as Windows 7 Loader, which in turn made use by various activators and toolkit to emulate a SLIC 2.1 on boot up.